If you are looking for a good, reliable and hassle free software for creating Wi-Fi Hotspot for sharing your Internet connection on your PC and Laptop then I can easily say that there is nothing better than Connectify. Connectify is a small software that is used to create Wi-Fi Hotspot on your PC or Laptop so that you can share your existing internet connection with other Wi-Fi devices. This means if you have internet on your PC (having Wi-Fi card or adapter) or Laptop and want to share this internet connection to other Wi-Fi devices i.e. PC, Mobile or Laptop etc. then you can do so by installing Connectify Hotspot software on your computer. You can say that it is a Virtual Wi-Fi Router and you have to carry it around to other places. The best part is that it is available for free but you can also purchase its premium versions which comes loaded with extra features and functionality. Using Connectify you can share any type of internet connection from your PC whether it is an ADSL, 3G / 4G dongle, LAN or broadband internet. Connectify supports Windows 7/8/10 Operating Systems, both 32-bit and 64-bit versions. For Windows 7 you may have to install KB3033929 security update to avoid any problems in future. 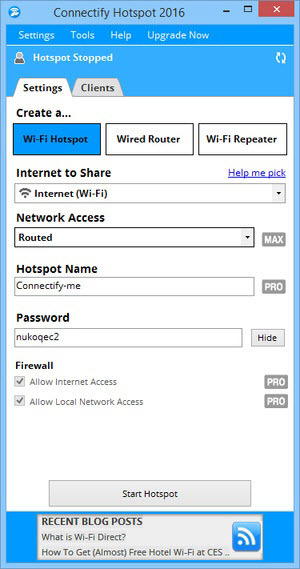 Connectify Hotspot 2016 is the only software around that can successfully create a hotspot on all Windows 10 computers because it supports the Wi-Fi Direct APIs. This is because Microsoft has removed Hosted Network protocol from their latest operating systems. Hosted Network (or SoftAP) was the most important feature that is needed by almost all virtual router applications to share your internet connection through Wi-Fi in Windows. The new solution is the Wi-Fi Direct API which was implemented in the latest version of Connectify so that it can be used with Windows 10 also. Connectify is available as free to download but its paid versions are also available which offers you lot more. The free version is very basic in functionality but the paid versions come with advanced extra features and functionality. You can download Connectify free version for your Windows PC or Laptop using the link given below. Note: This free version of Connectify Hotspot is also known as Connectify Lite. The paid versions Connectify has three different variants which are being discussed below. You can also say that these are Connectify Full versions. Connectify Hotspot PRO – Connectify PRO can turn your PC into a WiFi hotspot and comes with features like 3G/4G Sharing, Custom Hotspot Names, Wired Mode, and Advanced Firewall Controls. Connectify Hotspot MAX – It is the topmost version of Connectify that comes with all the features of Hotspot PRO and other advanced powerful, extended features like Bridging Mode and WiFi Repeater Mode to increase the range of your existing network. Hotspot MAX Lifetime 3x Bundle – It is Hotspot MAX version but it comes bundled with offer that includes a Hotspot MAX license for use on up to 3 computers. This means you can use this software on 3 PCs for a price which is much lower. Here is complete tutorial on how to setup, configure and use Connectify to setup Wi-Fi Hotspot to share Internet connection through Wi-Fi. 1. Download and Install Connectify Hotspot software on your computer. 2. Make sure your computer Wi-Fi adapater is connected and turned ON. 3. Launch the Connectify Application. 4. Give name to your Hotspot or SSID. 5. Then provide the password to your Hotspot or SSID. 6. Make sure that the ‘Internet to Share’ dropdown is set to the particular wireless or wired connection that you want to broadcast using Connectify Hotspot software. 7. Just click ‘Start Hotspot’ to being sharing your internet connection. 8. After that connect your other Wi-Fi devices to the Hotspot name / SSID and enter password that you have specified above. Important Note: Connectify Hotspot software requires Wi-Fi card or Wi-Fi USB Adapter with AP Mode otherwise it will not work, so make sure it has that feature. This is for precaution purpose only because nowadays all of the Wi-Fi adapters and Wi-Fi dongles come with AP mode functionality. Here are the major features of Connectify Hotspot software. Easy to Use and Setup – It is very easy to setup and use. You can setup and configure this software in seconds and then it will be ready to work as a Wi-Fi Hotspot. No Physical Router Needed – You do not require any physical router for this. The only requirement is a Wi-Fi adapter, Internet and supporting Operating System. Custom Hotspot Name – You can provide custom name to your Hotspot. Available in PRO & MAX versions only. Share 3G, 4G and Tethered Connections – You can share your USB 3G / 4G dongle internet or your mobile phone tethered connection using Connectify Hotspot software. In other words you can it can create Soft Wi-Fi for 3G / 4G Data Cards. Available in PRO & MAX versions only. WiFi Repeater Mode – You can also use this software to boost the range of your existing Wi-Fi Internet connection as it comes with the Wi-Fi Repeater Mode functionality. Available in PRO & MAX versions only. Bridging Mode – Using Bridging Mode you can Bridge various Connected Devices to Your Home Network. You can put all of your client devices right onto the source network that you are sharing, so that game consoles and other media devices work perfectly with it. Available in PRO & MAX versions only. Wired Router Mode – It also has reverse functionality too in which can you can share your Wi-Fi internet through LAN / Ethernet so that devices without Wi-Fi cards or adapters can also use your Wi-Fi connection. Available in PRO & MAX versions only. In the last I would like to say that Connectify is easily the best software for creating Wi-Fi Hotspot to share your Internet over Wi-Fi. It is also incredibly easy to use and setup. Connectify free version offers you the basic features and functionality but if you want the extra features, power and more performance out of it then you should go and buy the PRO and MAX versions which I think are really worth the price. 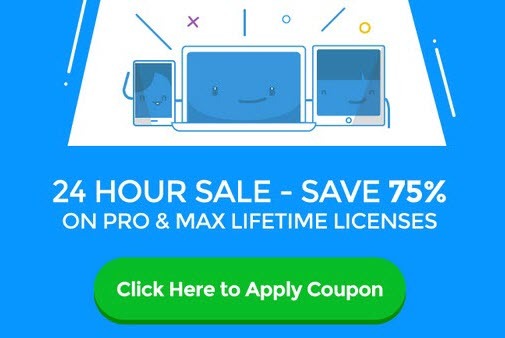 You can get 75% Discount on PRO and MAX versions of Connectify Hotspot by clicking the special link given below.